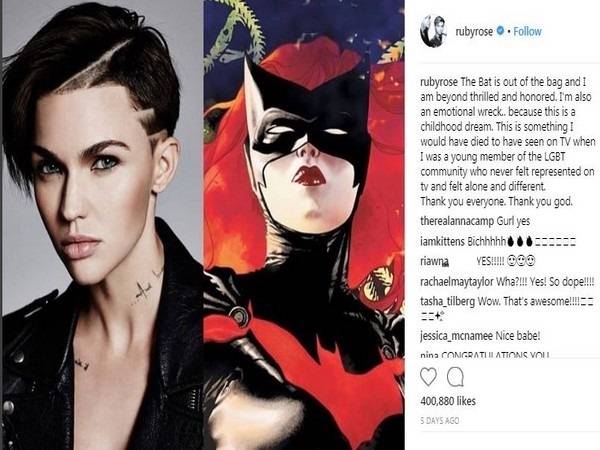 Australian actor Ruby Rose has quit Twitter after receiving backlash over her casting as lesbian superhero Batwoman in a new CW show. In an emotional social media post last week, Rose had announced that she is set to play the first LGBTQ lead in a TV series. However, according to The Hollywood Reporter, two days after the announcement, the 32-year-old deleted her Twitter account after some fans expressed their anger over the casting. Before bidding adieu to Twitter, 'The Meg' star responded to criticism in a series of tweets. The actor wrote that she wished "we would all support each other and our journeys." "Where on earth did 'Ruby is not a lesbian therefore she can't be batwoman' come from -- has to be the funniest most ridiculous thing I've ever read. I came out at 12? And have for the past five years had to deal with 'she's too gay' how do y'all flip it like that? I didn't change. I wish we would all support each other and our journeys," Rose wrote.